For the prawns, I placed two tablespoons of butter in a small saucepan, and sauteed some 6-8 cloves of finely chopped garlic for some 3-4 minutes and let this cool. I don’t like the taste or raw or undercooked garlic in a quickly barbecued shrimp, so this step ensures that the garlic has mellowed out. When this mixture is cool (you can speed it along by placing the saucepan over some ice from a cooler or freezer), mix in say a cup more of softened butter, salt, pepper, chopped parsley and some freshly squeezed dayap juice. Add more spices or seasoning if you desire. 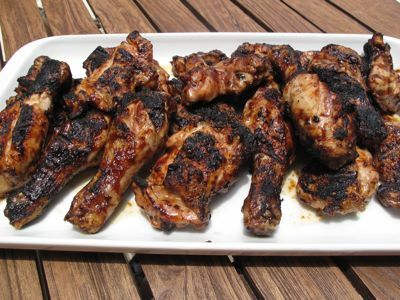 Sanojmd: the drumsticks and the thighs takes a long time to grill…I barbecue at least 12 to 15 chicken legs (that’s how many can fit ion the grill )on medium to low heat. Just like turkey, I use a brine, makes it moist even when barbecued for a while like this. It usually takes me 45 minutes flipping it over now and then so it cooks evenly…..tastes just like EL POLLO LOCO! The boys prefer their chicken barbecued this way kasi it makes the skin really crunchy and not soft and slimy. Then baste with your sauce until sticky. But try it au naturel without the barbecue sauces. If you have anyleftovers, makes great filling for soft tortillas…just like way they serve it at EL POLLO LOCO! Another option: barbecue on high heat until you get the grill marks and the smokey flavour….then once you have that, put them in a pan and finish in the oven. Once fully cooked, then brush with a glaze and return to the grill for a few minutes. 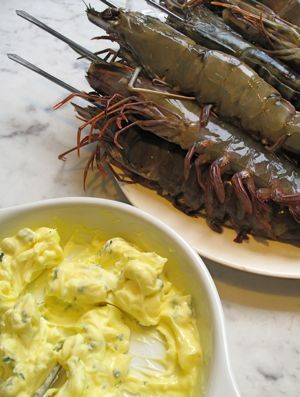 Would brining work on unpeeled jumbo shrimp/prawn to keep it moist and hopefully make it more tender once cooked? maybe i should make a huge slit at the back so the brining solution ‘takes’? jumbo shrimp/prawn always seem to be on the chewy side. Ms bettyq, i tried your ube puto recipe and it works great! thank you. i now have something quick to make out of fresh boiled ube. MM, i noticed you were polling readers about how much they’ve read of the archives. I hope youre not planning on taking out any of it? Marketmanila archives have become a real resource for me. So useful!! now going to look for something to do with mustasa my dad picked from his garden. i know i’ve read it there somewhere… maraming salamat! what brand of bottled bbq did you use, if i may ask? Is there a way of cooking chicken thighs and legs without scoring the meat like what usually happens at home? It has been a problem I have been struggling with because the chicken is usually scored at home so that it cooks through but ends up being dry. Thanks for the help and thanks! How do I tell when the shrimps are done? I usually do overcook them. One main stumbling block I encounter is the shrimp head. My meat looks done already but the head still is black in some sections. I’m not sure if it’s safe to have slightly raw shrimp head so I cook it some more but then I get overcooked shrimp! @bettyq: Ahhh, El Pollo Loco!!! I love that place! Cut up fresh mustasa into 1 cm pieces. Place in bowl with heavily salted water for 15 min or so then squeeze (piga) a few times. You may want to do a final wash to rid of extra salt. After final squeeze, place in a bowl, add a little vinegar and coarsely chopped salted egg. Dalish! Makes nice accompaniment for adobo, pork chops or fried fish. BettyQ, I think the distinct flavor of pollo loco is a tad of cumin powder with the lime. I have served it for folks who normally don’t like cumin ( they say ma-anghit) and they don’t even notice it. (BTW check ur hotmail). And my lifesaver on a lazy hot day not wanting to grill….garlic salt on drumsticks inside and outside of skin, good for two or three and broil in small oven toaster. serve with mustasa salad or blanched camote tops in lime sugar patis dressing. Dinner in 30 minutes and you can set the table while drumsticks broil. Where should I go to buy those small-ish metal skewers? And in general, does the heat conductivity of metal help cook the centers more quickly/evenly than say, if i were to use bamboo/wood skewers? Quillene: if you don’t want score it, then debone it. If I am “ganado”, I sometimes debone the whole chicken leg before barbecuing. It grills faster. But try the brining method I shared a loooong time ago….oh, please don’t ask me where I posted it! I think Rico might know where…It is soooo simple, the chicken is seasoned just right and stays moist and really tastes like INIHAW NA MANOK! Marichu: Yup, we go to great lenghts when we find a place we like. If not feasible, then like any other obsessed cook/baker like MM, TED, Maria Clara…I go to great lenghts to try and replicate it at home! Thanks for the mustasa salad recipe, Ms. Connie! Sayang, the mustasa is all gone in the garden. mm, as u mentioned short time of cooking d shrimps; like how many minutes? I usually overcooked mine. excuse my ignorance madam betty q., when you say brining is it boiling the chicken parts in water with salt? 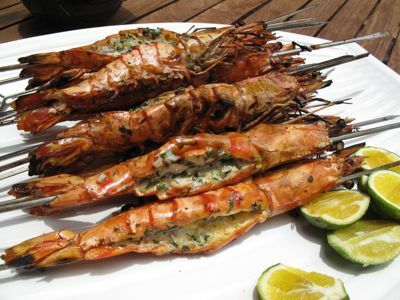 those prawns look so yummy, MM … one of my favorite dishes, will definitely keep this simple recipe of yours :) thanks !!! Grill or broil chicken on med hi. Brush reserved marinade on cooked chicken then pour garlic relish or serve on the side. Serve immediately. Oh bettyQ. THE PONY FINALLY ARRIVED! GAZILLION THANKS. Everything intact. Now for the XO sauce. You’re welcome, Doc! I hope pinakain mo the pony and gave him a drum of water to drink! The dried scallops, I think…one baby zip plck is about 1/2 pound more or less. Oh, that recipe you gave I think is similar to Nando’s here …Portuguese flame broiled chicken. I cannot imagine the Mexicans (where I think El Pollo Loco started) using cumin and coriander. But I think the Portuguese would! A friend of mine manages one of the Nando’s. She sometimes gives me some marinade. Now, I have a basis of comparison and see if what you posted is close enough. MARAMING SALAMAT! Tricia: brining is just soaking the cchicken in the seasoned salted water for a few hours or overnight. I think Alton Brown explains it much better than I can about the scientific principles and how it affects the meat thereby making it tender and moist. Just google it! Anyway, did you find the brining ingredients? if I am not mistaken, I think it is somewhere in MM”S post on Grilled Liempo! I brine now any meat esp. liempo before it goes on the barbecue! I think it is more Peruvian, but it is close to the chicken we get from the Pollo Loco places here except they have mayo ( which I don’t care for in my grilled chicken) or green chili sauce on the side. Do they also give you fried yucca ( balinghoy in Batangas and Mindoro) instead of potato fries? And you are right , cumin and coriander powder is used more beyond south of the border of Mexico in Central and South America . The addition of cumin is probably more Tex-Mex rather than authentic Mexican, as in chili con carne. Isn’t that interesting? The pony left the box at the door steps and had no time for a snack or drink. I think they are paid by the number of boxes they deliver per hour. and…my daughter is already in strawberry heaven. Thanks again and happy there are still recipes I can share that you haven’t tried. @Tricia, i got this from google, on how to brine pork. Grind everything in a spice grinder…not too powdery…just like fine ground pepper. Then make a coarse paste of : 1 large onion, 4 garlic cloves. a small piece of peeled ginger…pulse in food processor until finely chopped. Saute in oil until carmamelized. Huwag mo mamadaliin. It will take about 30 minutes. Then add the masala and your vegetables cubed. Add a bit of stock, adjust seasonng…salt/pepper. Oh, add thinly sliced green chilies. Eat with roti. this is prawns like how mom used to cook them…i miss that. Great tips and recipes as usual! Cherry tomatoes for salsa for that bbq chicken haaay! sarap! Hoy, Ted and everybody who wants to try the masala: the spice makes about 1 kg. My friend uses this in almost anything she cooks….so do not dump all of it in the patats! @BettyQ, again my deepest gratitude for going out of your way just to get my Potato Masala recipe. So i guess the masala spice can be kept on a container at room temperature for future use? Good thing i already have my digital scale. Will surely try this and email you the result.